This custom built stunner offers million dollar views of award winning downtown Greenville and the Blue Ridge mountains. 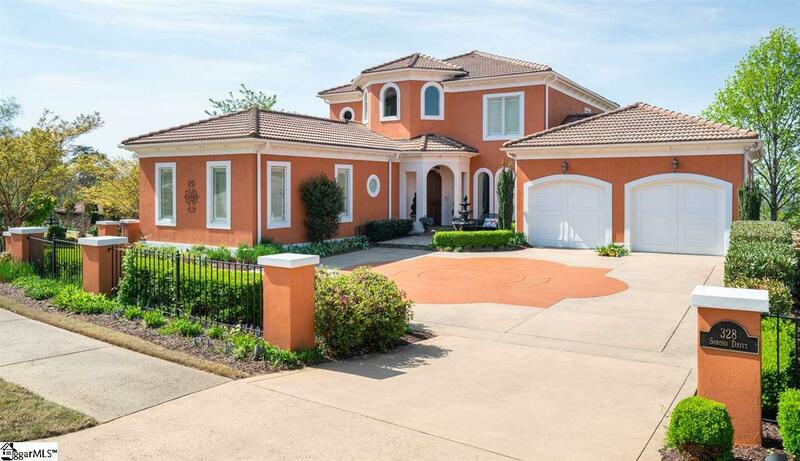 As you enter the circular driveway the curb appeal of this lovely home will be evident. The landscaping was professionally designed and is spectacular with lush plantings, multitudes of flowering shrubs, an entry landscape wall, a designed medallion in the driveway and a large water fountain by the front door. The tone of understated elegance that abounds in this meticulously maintained home has been established. The interior is warm and inviting with a multitude of windows allowing the views to be enjoyed from most rooms as well as allowing natural light to flood the home. 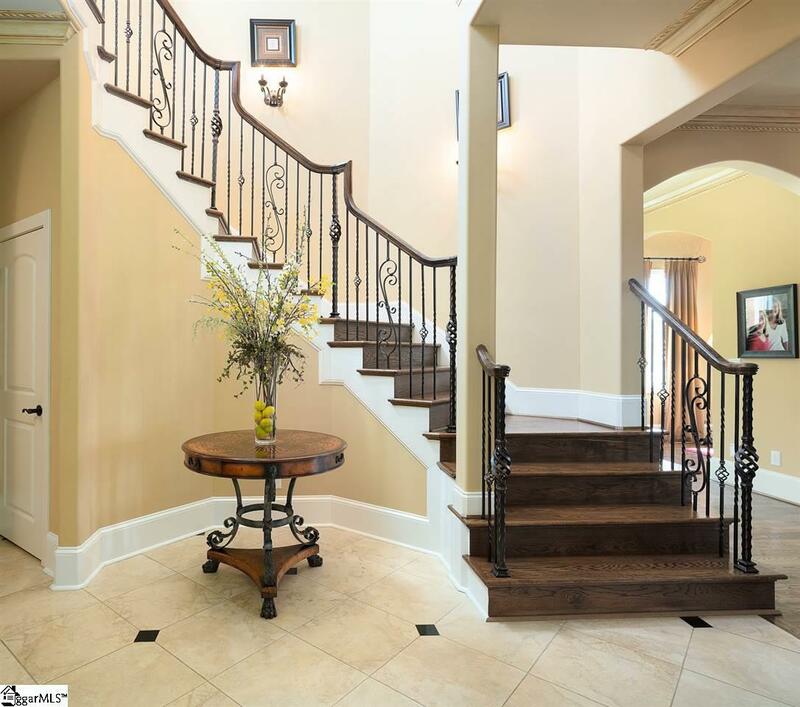 The foyer is elegant with a curving staircase and beautiful tile floor. Arched openings lead to the music room and then the great room which is expansive and open with warm hardwood floors and a lovely limestone surrounded gas fireplace. Steps away is the large sunroom where the views are truly spectacular. From this room one of the many outdoor areas is accessed and this terrace is a wonderful place to enjoy the sunsets and ever changing seasonal views. The kitchen is truly the heart of this home and is both large and inviting and is open to the great room and sunroom for ease of entertaining. The custom stained cabinets with beautiful granite countertops are plentiful. A stucco mantle over the gas range and the wood beams in the ceiling make the kitchen feel authentically Italian. The large breakfast area, breakfast bar, walk in pantry and grilling terrace all add to the appeal of this inviting area. The top-end appliances include a 5 burner gas range with dual fuel convection ovens, microwave, icemaker, dishwasher and refrigerator. The formal Dining room is steps away and rounds off the public areas of this home that begs for family gatherings and entertaining. The master suite is conveniently located on the main floor and is truly luxurious and very private. As you enter through the arched walkway, lined with built-ins, the expansive room will beckon. The master bath features dual sinks, a large tiled shower with multiple shower heads, an air-jetted tub and large walk-in closet with custom shelving. Also located on the main floor is the huge laundry room/butler's pantry that features a built in desk area with numerous cabinets and a 2nd dishwasher. There is another built in desk area just steps away for maximum flexibility in living preferences. Rounding off the main level is the elegant powder room for guests. The upper level has the perfect floor plan with two large bedrooms with on-suite baths. Also upstairs is a large rec room perfect for entertaining and features gorgeous views from the 3rd outside terrace. There is also a wet bar with refrigerator and large closet. The lower level has the 4th huge bedroom with an on-suite bath and features a steam shower. The bedroom also has access to the large screened porch with tiled floor and bead board ceilings. Also located on this floor is a home office and a den that could be an ideal home gym. The unfinished storage area is enormous and is the perfect place for storage or add extra finished space for a wine room or other needed rooms. There is also a very deep 3rd garage on the lower level that is accessed from the rear alleyway. Perfect for a 3rd car, golf cart or a workshop. The owners recently had two car garage floor epoxied, painted the exterior of the home, re-tiled the terraces and are leaving the window treatments, lower level screened porch furniture and accessories and cabinets in both upper and lower garages. The pool table, sauna and other items could be purchased for a negotiated price if interested. Villaggio features full landscape maintenance and is located in Montebello, a private gated community with tree lined streets offering many open parks, sidewalks, bocce ball, putting green, clubhouse, pool, tennis court and stocked fishing lake.